This article is within the scope of WikiProject Metropolitan Museum of Art. Please copy assessments of the article from the most major WikiProject template to this one as needed. 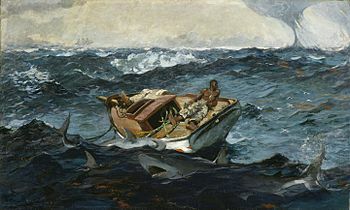 ... that Winslow Homer sarcastically explained that the figure in The Gulf Stream (pictured) "will be rescued & returned to his friends and home, & ever after live happily."?" A record of the entry may be seen at Wikipedia:Recent additions/2010/September. This page was last edited on 1 September 2017, at 02:36 (UTC).